Ahoy!! I'm back from a great trip to the Northern region of the Greater Kruger Transfrontier Park, with a ton of images to work through. I took some Nikon gear for a test run on this recent trip, and must say I am very pleased with the results. I'm also off to the scenic Western Cape in a few days, so I thought I'd quickly post a photo I processed tonight. This shot was taken on our recent trip to the Kgalagadi Transfrontier Park in the Kalahari desert. 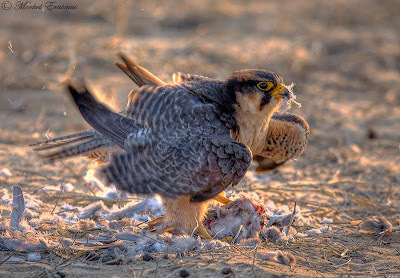 A lanner falcon had pummeled a laughing dove out of the sky moments before we arrived, and was already gorging on its prey. The sun was shining from the 'wrong side' (i.e. into the lens and rim-lighting the bird). No problem! I ran my processing on it to recover some detail from the front of the bird - and voila! This shot was taken just as the falcon was ruffling its feathers a bit. (Remember, you can click on the photo to view it bigger). In the meantime - enjoy the Christmas and New Year's celebration, and remember to spend some quality time with your loved ones. If you travel - travel safe. Did you use a single shot or multiple shots to do the HDR? Keep up the good work. I am watching and learning. Die foto is 'n mooie in my opinie. Goed Gedaan! What a beautiful photo capturing the essence of the Kgalagadi. Well done!